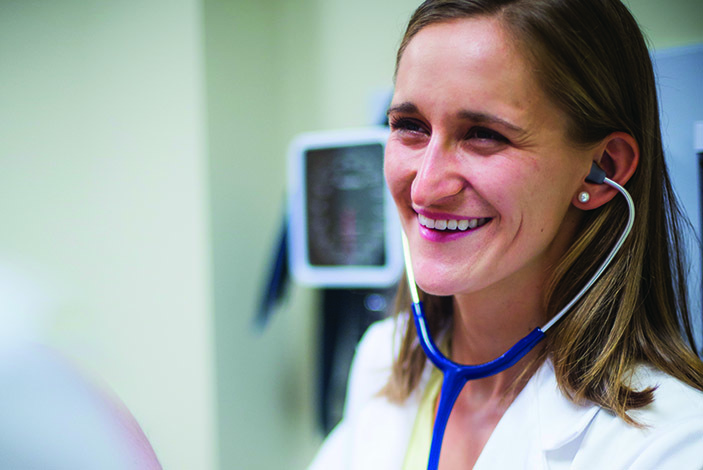 Anne Marie Kerchberger loves the patient-centered approach of primary care medicine but isn't sure yet what path she will follow in her career. 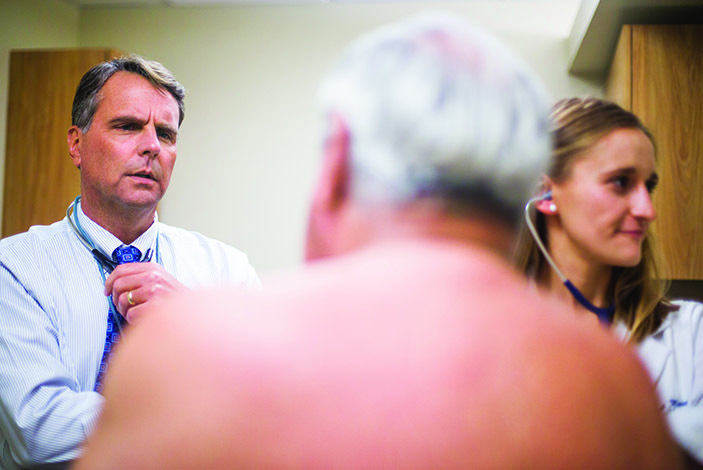 Paul Seavey, founder of the internal medicine clinic, cared for U.S. and Emory presidents and CEOs, but all patients received the same level of care and personal attention—an approach passed on to medical trainees at the Seavey clinic. 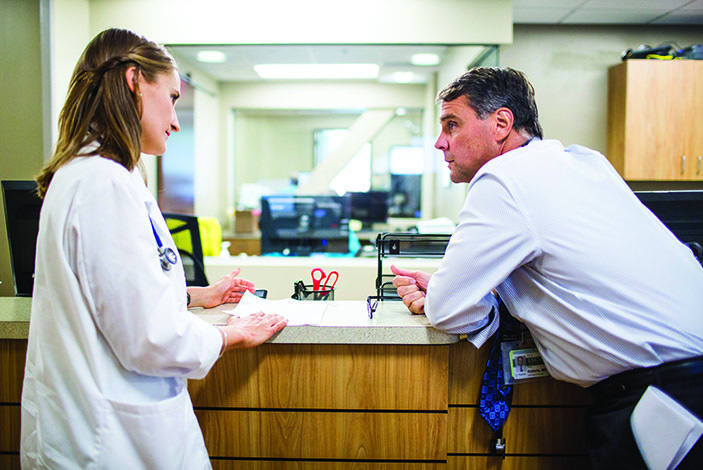 Dr. Dave Roberts (pictured with Kirchberger and a patient), director of the Seavey Comprehensive Internal Medicine Clinic, carries on Paul Seavey’s philosophy of care. Third year medical student Anne Marie Kerchberger and Dr. Dave Roberts, director of the Seavey Comprehensive Internal Medicine Clinic. Clinical care group, including Kerchberger and Roberts, at the Seavey Clinic. Before entering medical school, Anne Marie Kerchberger worked for an ophthalmologist who saw up to 80 patients a day. Kerchberger wanted the chance to develop strong relationships with her patients and to spend as much time as she could with each one. But she was beginning to think this kind of doctor—or level of care—didn't exist anymore. 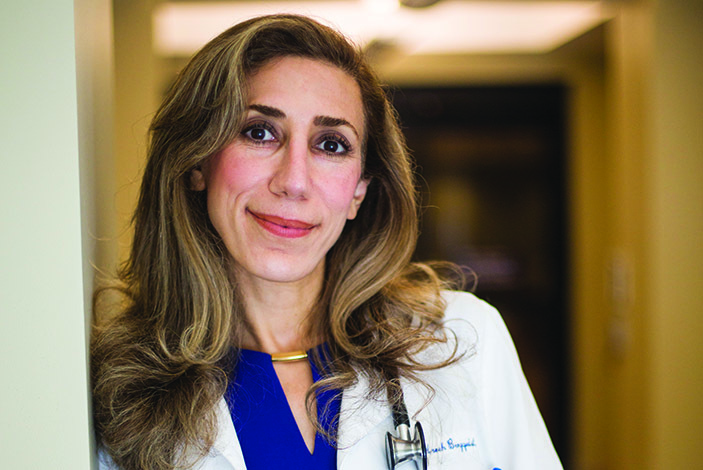 Kerchberger's recent training at Emory's Paul W. Seavey Comprehensive Internal Medicine Clinic opened her eyes to doctors who fulfill a modern version of the iconic family physician—the trusted expert who spends time listening to their patients' concerns. 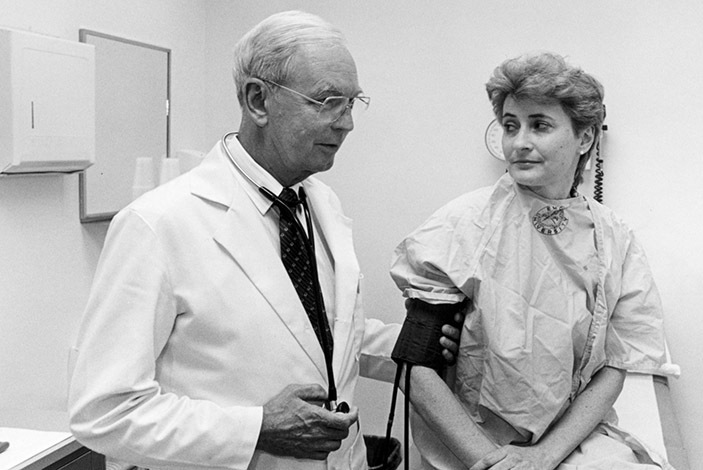 Located in Emory Clinic A, the internal medicine clinic reflects the charismatic style of the late Paul Seavey, a long-time Emory internist and professor of medicine who treated three Emory presidents as well as other prominent community members. His friendships with these Atlanta leaders led to a continued philanthropy that helps fund the clinic's eight physicians. "Dr. Seavey epitomized the essence of the Emory physician," said Amy Rollins Kreisler, whose grandfather O. Wayne Rollins was a Seavey patient and whose family foundation recently made a second $5 million gift to the clinic. "That is what we hope will be instilled in the doctors who are training here." Other VIPs treated at the Seavey Clinic express gratitude for their care by paying it forward: More than $35 million in donations have come from grateful patients in the past 28 years. That philanthropy helps recruit great medical students regardless of their financial need, recruit and retain faculty physicians, and support research. "This is going to feel a little bit uncomfortable," Kerchberger, 25, says to Frank Erbrick, 77, a retired UPS information technology executive, as she palpates his abdomen. "Take a deep breath in . . . and all the way out." She is in her third semester of medical school, and David Roberts, who trained under Seavey and now runs the clinic, has told her to find Erbrick's liver. The conversation and atmosphere between the three is casual and relaxed, covering Erbrick's dog walking, smoking, and family members with cancer. Roberts and Erbrick have been doctor-patient since the early 1990s, when Roberts flat out told Erbrick he had to sober up or find another physician. Erbrick did more than that. When the Seavey Clinic needed technology upgrades, Erbrick helped get them installed; other patients donated funds. "He's the best thing that ever happened," Erbrick says of Roberts. "My family could never pay for the care he has given us. He is the consummate ideal of what a doctor should be." No one rushes much at the Seavey Clinic; it has more of a business feel than medical. Ricky Aaron, the Emory Healthcare director of infrastructure virtualization, has the next appointment. At 59 and Roberts' patient for more than 20 years, Aaron mentions that he is building a barn, and that a sleep study has helped with his apnea. He has a wart on his left elbow that Roberts freezes with liquid nitrogen. "You have to kill the base of the wart," Roberts tells Kerchberger. "That's where the virus and rapidly growing cells are. They're like coral, but the living part is on the bottom, not the top." Roberts learned his approach to care at the side of Seavey, especially the soft skills—making a patient feel that nothing matters more than their health. After serving in World War II, Seavey attended Emory College then the medical school on the GI Bill. During his residency, he lived in a closet-like room at Emory Hospital and later married an Emory nurse. He was known for his starched white coat, white hair, and confident manner. He strove to be accessible to his patients all the time, responding quickly to their concerns. This brand of medicine was exactly what Roberts desired, and, as his own medical school years wound down, he refused to be pressured into specializing. Close, personal relationships with patients are not a bygone, romantic ideal to him; they offer an antidote to physician burnout. "The only other physicians in my family were a great-uncle and his father who made house calls in Missouri in a horse and buggy and got paid in chickens and apples," Roberts says. "The image of being one-on-one with a patient over time is what I wanted, and you can't do that in other fields of medicine." Perhaps the best measure of Seavey came from the many doctors who sought him for their own treatment. Seavey believed that no one could care for the whole person better than the general internist, who by definition is in charge of every aspect of a patient's health. Because these types of doctors generally have fewer research and scholarship opportunities and their productivity is usually measured by the number of patients they treat, Seavey advocated for more academic resources and promotions for them. With patients ranging from former President Jimmy Carter—who threw a surprise birthday party for him—to Emory trustees and everyday Atlantans, Seavey was driven by intense curiosity. "He was a listener who loved stories," says his daughter Cheryl Seavey Murphy, who like her sister Susan trained as an Emory nurse; sister Carol is an Emory College grad. "From Georgia farmers to international executives, he loved their stories. People opened up to him, and his bottom line was that the rest of their health may be related to their stories. That's why he would take one and a half hours for an initial workup. His overarching theme was 'what matters in life is people.' "
John Rollins, the brother of O. Wayne, became such good friends with Seavey that they and their wives vacationed together abroad, traveling in the Rollins jet. Seavey cared for four generations of Rollinses. "They both loved rags-to-riches stories, that if you had intuition and grit and hard work, you could achieve your dream, and Emory offered that possibility," Murphy says. "Whether you succeed or fail, you just keep going." Seavey's first major gift came in 1988 with a $1 million donation from Jack Lupton, a Coke bottler whose philanthropy transformed downtown Chattanooga. The Seavey Endowment encouraged Emory's top primary care doctors through special awards, research funds, opportunities for lifelong learning, and generous distinguished clinician awards. "Dr. Seavey wanted to make sure physicians weren't on a treadmill of 25 to 30 patients a day, to protect the time to get down to what's going on," said Ronnie Jowers, recently retired vice president and CFO of Woodruff Health Sciences Center. 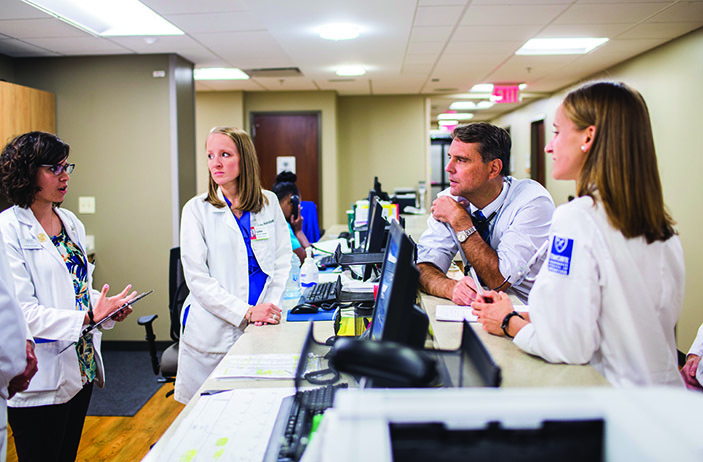 "For Emory physicians, the endowment money is the carrot of opportunity to practice differently." Seavey established Emory's executive health program, which along with Special Diagnostics Services is headquartered at the clinic. "An executive physical is part of the benefits package that recruiters use, like stock options," says Seavey Clinic nurse manager Trish Archer, who partnered with Seavey for almost 20 years. "He knew that to get quality residents in primary care, you had to give them a great experience." The O. Wayne Rollins Fund for Clinical Excellence supports the Seavey Clinic's faculty physicians, known as Rollins Distinguished Clinicians, and the Executive Health Discovery Database, which identifies and measures markers of health and disease. The most recent $5 million Rollins donation allows the Seavey model to move forward with sustainability. Patricia Keegan, an advanced nurse practitioner in cardiology at Emory, says training at the Seavey Clinic "reaffirmed my faith that it's OK as a provider to look at each person as a whole, that understanding their social interactions, and financial and medical concerns are part of developing goals of care and meeting them." This, she says, is especially important with tough conversations, such as how an elderly patient plans to maintain independence. "I hope to be able to teach others by example," Keegan says. Just as Seavey would have wanted.